As with every seminar weekend at The Edinburgh Lectures, the science, art and philosophy of Chiropractic will be shared from our stage by 11 inspirational Chiropractic experts from across the UK and the wider Chiropractic global community. Each individual message will help you reignite your passion, refocus your purpose and inspire you to be the change you wish to see in the world. This year's seminar is titled Create Your Masterpiece and as always we welcome many Chiropractic superstars. The weekend kicks off with our stand alone, one-day intensive seminar with internationally-renowned chiropractor and wellness expert, Dr Dane Donohue who will be teaching his stress and lifestyle workshop, ‘Delivering on the Promise of Health in the Chiropractic Functional Wellness Practice’. Our weekend speakers include chiropractic neuro-experts, Dr David Fletcher and Dr Liz Anderson-Peacock, chiropractic nutrition expert, Dr Robert Silverman, communication superstars and practising chiropractors Dr Pam Jarboe, Dr Cornell Zues Cornish and technique experts and philosophy gurus, Dr Shawn Dill, Dr Lacey Book and Dr Jeb McAviney. We are also honoured to welcome superstar chiropractic advocate, Melissa Sandford to our stage. Together with the CA training programme on the Saturday afternoon, the Friday seminar and weekend conference offer up to 17.5 hours of world-class CPD credits. Our Saturday night Ceilidh, or Scottish Dinner/Dance (ticket included with registration), is a time to connect with friends and enjoy an evening celebrating all that is good about our profession. Please stay connected to us via our Facebook page where up-to-date information will be posted. Supersaver booking (29th March 2019) and team discounts mean it could not be easier to register and bring your teams to be inspired! 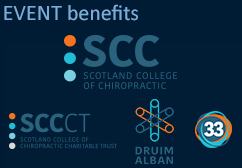 The Edinburgh Lectures is a non-profit organisation and any profits from the event will be put towards the setting up of a new principled Chiropractic degree programme in the UK, The Scotland College of Chiropractic, which is planned to open in 2020. We look forward to welcoming you to Edinburgh in June.